Sour beers are nothing new. The style originated with Trappist monks in Belgium, who have been brewing tangy-tasting lambics as far back as the Middle Ages. Up until a decade ago, beer fans had little interest in sour varieties. Today, nearly every major American craft brewery has dabbled in sour beer. GAYOT’s list of the Best Sour Beers includes a wide range of options, from ales crafted with wild yeast strains to those brewed with fruit. To help you pick the right beer for your palate, we’ve also given each entry a sourness rating. Pucker up and enjoy these tart yet tasty brews! If you need one more reason to drink up—moderately, of course—take a look at these Health Benefits of Beer. Price: $13 for 750 ml. 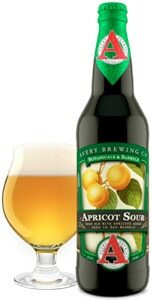 Released in February 2017, Apricot Sour is the fourth beer to join Avery Brewing’s Botanicals & Barrels Series, which requires the beer to be aged in barrels for at least three months and consist of just one additional ingredient besides the standard grain, hops, yeast and water. In this case, that special ingredient is more than 23 pounds of apricot purée per barrel of beer. Aged for four months in neutral oak barrels, it’s soured with Avery’s proprietary 10-year-old house blend of Lactobacillus and Pediococcus bacteria and Brettanomyces and Saccharomyces yeast. The end product is full of tart lactic acid with minimal malt. Plenty of apricot comes through for a flavor that is juicy, bright and tangy. Since opening in 2008, The Bruery in Southern California has become known for its barrel-aged and experimental ales. This release from Bruery Terreux, a branch of the brewery that focuses solely on farmhouse-style ales, is part of the Tonnellerie series. French for “cooperage,” each beer in the series shares one core trait: it’s fermented in oak. The Quadrupel style is quite malty and rich, and since this one is also barrel-fermented with blackberries, levels of dark fruit flavors complement the undercurrents of oak. The sour components act to counterbalance the maltiness, and the fruitiness comes through after swallowing. This sour beer is definitely full-flavored with a sour tang, so be ready to pucker up. Brewed by: Devils Backbone Brewing Co. The German Gose style combines tart beer flavors with a touch of salt and coriander. 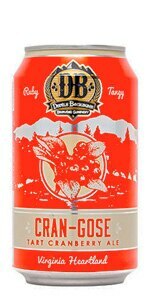 In this case, Devils Backbone brewmaster Jason Oliver also chose to add hundreds of pounds of puréed cranberries. Its ruby-pink appearance with a frothy white head is so pretty you may not want to disturb it. However, once you do, you’ll be rewarded with a light, crisp and easy-drinking brew. Unlike many cranberry drinks, this one has no sweetness, allowing the tart fruit flavor to shine. This low-gravity session beer, conveniently packaged in cans, is part of the brewery’s Daypack Series, named for being easy to store in one’s travel bag. This beer is named in honor of Duchess Mary of Burgundy, who reigned over the Low Countries in the late 15th century. 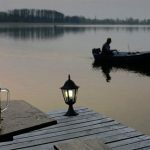 The reddish brown ale from the West Flanders region of Belgium takes quite a long time to make — it’s aged for 18 months in oak casks and then blended with an 8-month-old beer. The aging adds complexity and the acidity characteristic of a Flanders red ale. The high level of carbonation may remind you of a Prosecco, and helps to increase the aroma, which brings a hint of vinegar and fruitness. A slight malt flavor is matched with candy sweetness followed by a dry, tart and acidic aftertaste. The sourness level is quite low for a Flanders Red Ale, making it ideal for those unaccustomed to the style. Price: $21 for 750 ml. Half Moon Bay Brewing Company launched its Ocho Barril series of sour barrel-aged beers in 2016, with each batch producing 420 gallons in eight oak barrels. It’s fermented with a combination of Saccharomyces, Brettanomyces, Lactobacillus and Pedioccocus to create a mélange of bright acidity and a funky barnyard finish. Red Sails in the Sunset is the third beer in the series, spending 18 months in a pinot noir barrel with the last four months aged upon tart cherries from Michigan. A bright cherry aroma bursts through after pouring, and the reddish brown tint also references the fruit. The flavor brings a fair amount of oaky complexity but the fruit helps to temper the sourness, making this a sipper that, just like Goldilocks would say, is just right. Price: $28 for 750 ml. The family-owned Lindemans has been brewing lambics since 1822 in the small village of Vlezenbeek, Belgium. The region’s air is loaded with hundreds of specific wild yeasts, which allow the brewery to craft lambics using spontaneous fermentation. This limited edition is a collaboration with the Danish gypsy brewer Mikkeller, and is reputed to be the first-ever lambic fermented with fresh basil. A blend of 1-year-old and 2- to-3-year-old lambics aged in oak barrels is mixed with whole fresh basil leaves, which contribute to a beautiful aroma and fresh flavor that tempers the tartness of the ale. Bottle conditioning gives the beer a soft carbonation that allows the flavors to burst forth. A crisp, dry and tart finish with lingering hints of basil makes this lambic ideal for pairing with pesto or marinara pasta. Price: $15 for 22 oz. New Belgium has been making sour ales perhaps longer than any American brewery, having launched its wood beer-aging program in 1997. The Belgian-inspired brewery’s latest creation adds fruit into the mix for a refreshing oak-barrel-aged lambic. This transatlantic collaboration begins at the 130-year-old Oud Beersel brewery in Belgium. After aging for one year, the beer is blended with tart cherries before crossing the Atlantic and making its way to Colorado. There, New Belgium brewmaster Peter Bouckaert mixes the kriek lambic with the brewery’s own sour beer and a golden lager. The result is an intense cherry aroma that leads to a pleasing fruity sweetness balanced with a bright, tart finish. Released in August of 2015, this beer’s name literally translates to “sour pineapple” in Spanish. The idea for the ale was conceived by Odell Brewing’s resident engineer, Matt Bailey, who had a hunch that pineapple would work well with the sour brewing process. Pineapple comes to the forefront in the aroma, which is joined by sour lactobacillus and earthy brettanomyces, the beer’s two souring agents. The flavor of this well-carbonated, golden-colored ale brings a pleasantly acidic shock, with tropical flavors of pineapple, guava and passion fruit tickling your taste buds with a sweet and sour balance. Each year, beer aficionados anxiously await the annual release of Flanders Red Ale. The beer is aged for two years in gigantic oak casks called foeders, some of which are more than 150 years old, where bacteria and wild yeast thrive while allowing just enough oxygen to get through the porous surface. Belgian standout Brouwerij Rodenbach experiments with multiple foeders, although only the very best cask is released annually. The cask number always appears on the label (in this case 170), and the year refers to the start date of the maturation process. It turns out 2012 was indeed a good year, as this vintage delivers aromas of balsamic vinegar and cherry, with a sublime balance of sweetness and sour. This vintage was well worth the wait and is a great way to experience the handiwork of a single barrel. Developed over two years, Otra Vez is Sierra Nevada’s first Gose — a nearly extinct style dating back to the 16th century. Originating in Goslar, Germany, the ale is noted for its tart flavors balanced by coriander and salt. This hazy, golden-hued version is decidedly Californian, incorporating two plants grown in the state: grapefruit and prickly pear cactus. Cactus flavors predominate, while hints of grapefruit add to a palate that is both tangy and sweet. The beer’s name translates to “again” and you’ll find yourself reaching for your glass again and again.